The Custer Soil Conservation District was activated in June of 1953 with the organization of the board of supervisors. An election was held the previous winter with 49 votes being cast in favor of forming the district. The first meeting was held on June 10th, with James F. Jones being named Chairman. The extreme expanse of the District made its supervisory and servicing problems unique among the Soil Conservation Districts of Idaho with many farms being located more than 100 miles from the District office. The agricultural lands were divided into four district geographical areas. Each of these areas was represented on the District's Program and Work Plan and to give representation in the more remote regions. The Board of Supervisors included James F. Jones of Leslie as Chairman; Jack Burstedt of May as Vice-Chairman; Niel Gilchrist of Mackay as Secretary and Treasurer; Eddie Baker of Clayton as an Associate Member; and Lawrence Bradbury of Challis as an Associate Member. activities were: frequent conservation articles in the local newspaper and the sponsoring of an entrant in the Spencer Chemical Company's public speaking contest. During the first six months of activity 59 farmers, involving 76 individual plans and over 29,000 acres applied for planning assistance. In 1956 the District purchased its first equipment with the purchase of an Army Surplus HD-7 crawler tractor. Thus began the slow process of acquiring equipment for the cooperators use in leveling, ditching and upgrading of their ranches. Also plans were made for the first poster contest to take place in 1957 in the Custer District. Land leveling and continued irrigation improvements to conserve water continued to be the cooperators main work projects. 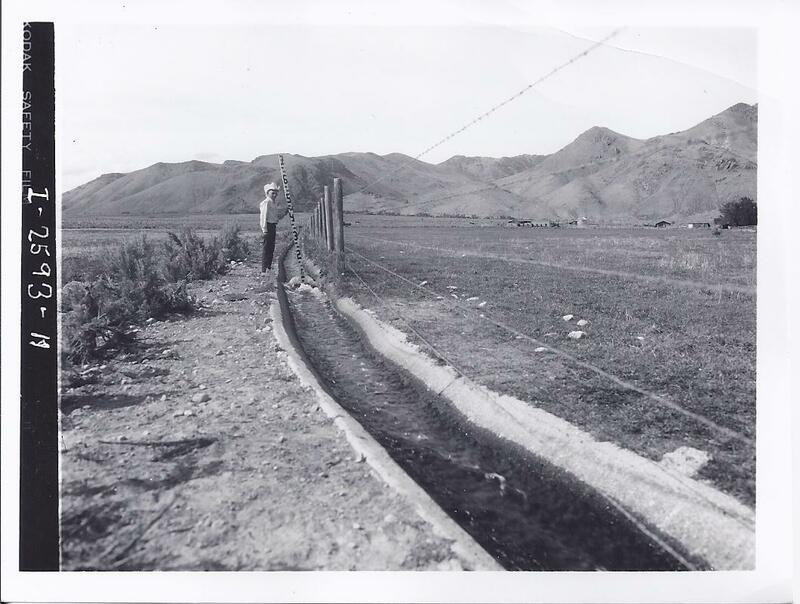 Some concrete linings were poured in irrigation ditches. Rock rip-rapping along the Salmon River continued. Many rock rip rapping projects along the Salmon and its tributaries have been completed over the years with many thousands of yards of rock being placed to help control soil erosion. 1966- Jack Whitworth holds a measuring device in a concrete ditch that was installed by Carl Peterson in 1950.